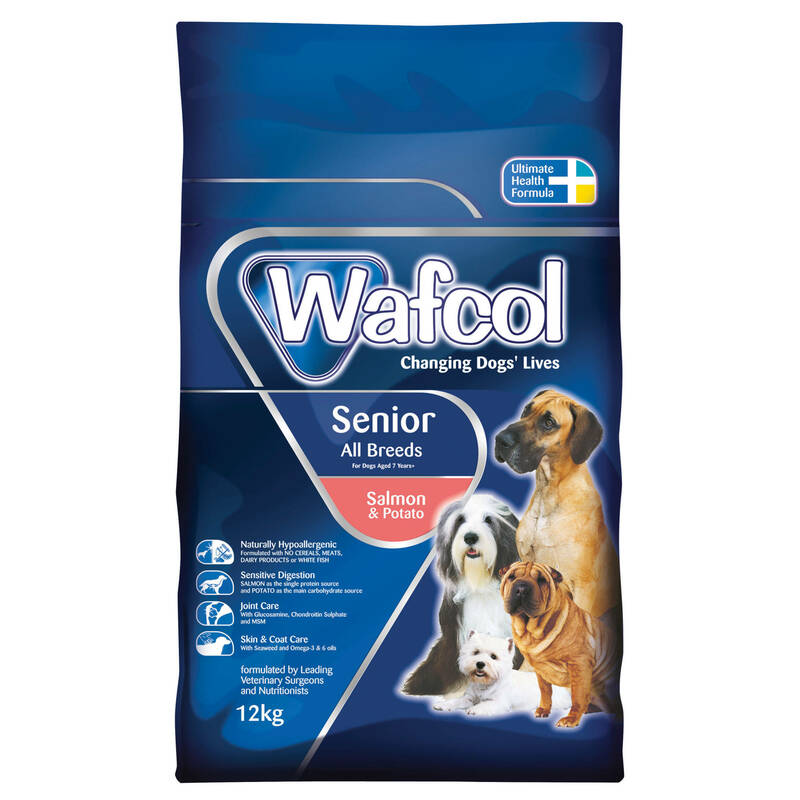 Wafcol Super Premium Senior is wholesome diet, specially formulated for older dogs with food intolerances and digestive sensitivities. The diet contains a hearty blend of prebiotics, essential omega fatty acids and white meat proteins for the complete nourishment and protection of your dog, helping to promote lasting health, vitality and happiness. To reduce the risk of exacerbating digestive sensitivities, allergies or internal discomfort the recipe contains no wheat, wheat gluten, oats, barley or rye, so you can be assured your dog is receiving the very best in dietary care. Omega fatty acids will enhance the condition of your dog's skin and coat, whilst corn will provide sustenance and energy and added seaweed will aid in the growth and repair of tissues. Teeth and bones will also be supported by specifically adapted levels of phosphorous and calcium. A great, nutritious and palatable diet to appeal to the most selective appetites. Vitamins (kg): Vitamin A (as retinyl acetate) 14,867 iu, Vitamin D3 (as cholecalciferol) 1000 iu, Vitamin E (as alpha tocopherol acetate) 111 iu. Below are some recent questions we've received regarding Wafcol Super Premium Senior Salmon & Potato Dog Food, including answers from our team. My 5 year old terrier has been diagnosed with pancreitis, what is the fat content of Wafcol salmon and potato food? According to the manufacturer, Fat Content = 8.5%. This is higher than some other foods and so might not be appropriate for your dog, although pancreatitis is an odd condition and it is difficult to understand what exactly triggers a flare up in symptoms. Fat level of the food is only one factor. Bodyweight is also very important, so make sure your dog is not overweight if possible.